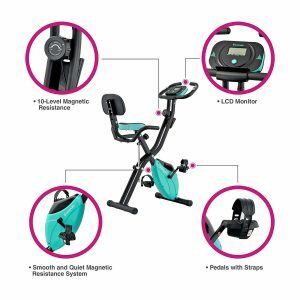 If you are looking for one of those inexpensive but decent indoor workout equipment that provides quality cardio workouts with comfort in the convenience of your home then the Harvil Foldable Magnetic Exercise Bike with 10-Level Adjustable Magnetic Resistance and Pulse Rate Sensors should be under your radar. It is not very difficult to conclude that this unit is recommendable even though the brand name may not be known to some folks. 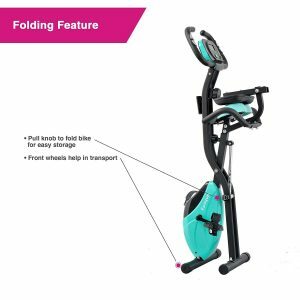 First thing first, the popularity of the Harvel Folding Magnetic Exercise Bike is well established and we can say without reservations that it is one of the best folding exercise bikes in its category. In our opinion, the other folding bikes that could be compared to this unit are the Exerpeutic Folding Magnetic Upright Bike and the Innova XBR450 Folding Upright Bike because they have similar popularity. The Harvil Folding Magnetic Exercise Bike is just like the majority of the other folding exercise bikes, compact but different in the sense that it has 10 levels of resistance instead of the prevalent 8 levels. It is great for home use and especially for those that have a space problem. It also comes in 3 color variations which are aqua, black, and peach. All the variations are the same in price and features except for the colors. This Bike is a semi-recumbent folding bike that offers extra comfort and support to the lower back. It could also be an ideal bike for individuals that wish to undergo a physical recovering. Click right here to have a peek at the discounted price of the Harvel Folding Magnetic Exercise Bike on the Amazon. The construction of the Harvil Foldable Magnetic Exercise Bike with 10-Level Adjustable Magnetic Resistance and Pulse Rate Sensors is solid as the frame is made of steel. It supports 330 pounds/149.6 kg maximum user weight capacity. The frame is coated with anti-corrosive and scratch paint that prevents rusts and scratches. It is simply a bike designed to provide stability even though it is a compact and lightweight machine. It has a well-structured base framework that is made up of two tubular stabilizer bars, one on the rear base and the other at the front base. These ensure stable workout that is void of unnecessary movement and wobbling. Even though it is a lightweight machine that weighs just about 44 pounds/20 kg that also adds to its overall stability while it makes mobility or relocation process much easy. Although some users usually buy the machine together with a protective rubber mat to prevent any instability that might be caused by an uneven floor and to also protect the floor from scratches. Speaking of portability, the unit is integrated with two transport wheels at the front base for easy relocation. Aside from the fact that the machine is foldable, it is equally compact which appeals to almost everyone and most especially those that have concerns about bulky equipment due to lack of space. The overall assembled dimensions of the Harvil Foldable Magnetic Exercise Bike are 26.4 inches long by 20 inches width by 46 inches tall and it is much less when folded; the folded dimensions are 19.5 inches long by 19.5 inches wide by 54.3 inches tall. Obviously, the machine is reduced by a couple of inches in length when folded. A workout area of 2.2 feet long by 1.7 foot wide will be required. However, it is recommended to consider leaving extra 2 feet at the rear and each side of the machine while working out for safety and convenience purposes. The Harvil Semi-Recumbent bike is fully adjustable thus has some level of flexibility to accommodate users of different heights comfortably. The seat, the handlebar, and the pedals are an integral part of an upright folding bike responsible for comfort the user experiences which ultimately affects the outcome of the workout session. Differently put, if the seat, the handlebar, and the pedals are ergonomically designed chances are users should be able to work out longer while they enjoy doing so. Ultimately, a user could be able to achieve fitness objectives relatively easy. That said; let’s see what these elements are made of. The unit has a semi-recumbent seat that is great for supporting the back thereby giving comfortable leverage for thrusting while pedaling. The seat has a backrest that is comfy and durable as well. Both the seat and the backrest are adequately cushioned and covered with neat and solid upholstery. Needless to say that the seat is wider and thicker than the ones found on the regular spin bikes. It is also 4-way adjustable. This means that you can adjust it vertically (upward/downward) and horizontally (backward/forward). It can be adjusted 5 or 6 notches vertically and the minimum height the bike accommodates is 3 feet 10 inches. The seat also has handles that are coated with rubber material on each side of it for extra support when you sit back and pedal. However, some users think that the seat is not super comfortable. They think that the backrest is too low or short to the back and needed more foam. A gel seat cover could be used to improve the comfort the seat provides. The handlebar has a multi-grip design that offers options for different grip positions. It is coated with rubber foam material to provide comfort and a firm grip that prevents blisters in the hand and slippage as a result of sweaty palms. The handlebar is also integrated with HR sensors that transmit the heart rate data to the monitor when gripped on during a workout. The pedals have an anti slip design with adjustable safety strap that secure the feet during a vigorous workout. That said, the safety straps are just about 11 inches long and may not accommodate all different types of gym shoes. The Harvil Foldable Magnetic Exercise Bike features a belt drive system. This usually consists of a small precision weighted flywheel that weighs about 5.5 pounds, belt and strong crank arms. The drive provides a smooth and quiet operation that won’t bother the user much less the family or neighbors. It is also worth mentioning that the drive is maintenance free. It does not require any periodic lubrication or adjustment. The Harvil Foldable Magnetic Exercise Bike has a manual magnetic resistance system. This provides effective resistance that is going to be appreciated by beginners and intermediaries. It is whisper quiet when at work due to the fact that the magnetic brake pad does not make direct contact with the flywheel but instead generates resistance by the level of magnetic field available. There are 10 levels of resistance available and could be adjusted via the tension knob. To increase the resistance level simply twist the tension knob that bears the numbers 1 to 10 clockwise and to decrease turn anticlockwise. It is very easy and simple to adjust to whatever resistance level you wish to use for your workout. The Harvil Foldable Magnetic Exercise Bike is supplied with a basic console. There is a digital monitor that allows you to track your workout progress. You should be able to view workout data such as speed, distance in miles, time, calories burned, and heart rate. The values are displays with good readability, however, could be compromised when viewed in a poorly-lit room or environment because the monitor is not backlit. It has a SCAN function that rotates the values one after the other after a few seconds. You can also decide to set a certain value of your choice to display constantly. The LCD monitor does not need any electricity in order to power on but it uses 2 AAA batteries which are included. In order to save battery power, the monitor hibernates when the machine is idle for a few minutes and comes on when there is activity on it. It can also be turned on by pressing the only button on the console. The console also has something like a ledge, suppose to be a tablet holder. This is meant to hold a tablet but may not be able to securely hold one without dropping. Moreover, if you succeed in placing a tablet on the holder you will not be able to view the values displayed on the monitor because it will block it. The Harvil Foldable Magnetic Exercise Bike basically has only one accessory which is a tablet holder. Even at that, users have doubts if they could actually risk placing their iPhone or Android phone on it because it is poorly designed. Moreover, putting a device on the tablet holder also means blocking the monitor’s workout display from being viewed. It does not have a water holder which is essential, however, this could be attached if you so wish. The storage of the Harvil Foldable Magnetic Exercise Bike is not really a problem, not even to those with a space problem. This is a compact bike with foldable dimensions of 19.5 inches long by 19.5 inches wide by 54.3 tall. You can easily find a storage space for it. It is a lightweight machine that weighs 44 pounds/20 kg integrated with transport wheels for relocation purpose. The Harvil Foldable Magnetic Exercise Bike has a positive approval rating even though some of the users think it could have been nearly a perfect machine if the seat is redesigned. However, for what it worth, users recognize that this is a cost-effective bike that is affordable and that reflects on the Amazon customer reviews. The Harvil Foldable Magnetic Exercise Bike is shipped in a box, usually without damage. If there is any damage it will be replaced. The shipping cost depends on the retailer you purchasing from; however, some vendors such as Amazon provide free shipping. The Harvil Foldable Magnetic Exercise Bike is pretty easy as the major parts/components are preassembled. There are no parts all over the place. All the bots and washers are already on their respective parts and therefore sorting is eliminated. You are required to attach the stabilizer bars, the handlebar, that seat, the pedals, and the console to the frame. This won’t take up to an hour to completely assemble. The required assembling tools and instruction manual are included with the package. Also, there is an assembly video available on Amazon. As far as the Harvil Foldable Magnetic Exercise Bike is concerned, you don’t have any business with any major maintenance such as periodic lubrication and adjustment. You only need to always examine the bike for any loose, worn, or broken part at all times before use. Do fix any problem that may arise accordingly. Finally, endeavor to always keep the unit clean at all times because it is finished with powder coating which could preserve the original appearance for a very long time. 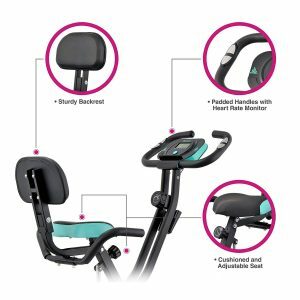 The Harvil Foldable Magnetic Exercise Bike with 10-Level Adjustable Magnetic Resistance and Pulse Rate Sensors is a bike that could be recommended to anyone in a heartbeat, especially those that are on a budget. It is a bike that has its downsides but still cost-effective. Users have expressed satisfaction and this could be seen on the Amazon customer reviews. However, if you are still willing to look further you may want to look up the Sunny Health & Fitness SF-B2721 Comfort XL Folding Recumbent Bike because it has a better seat construct but slightly pricier.